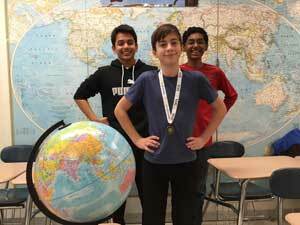 Hutchinson wins Templeton Geographic Bee - Hamilton School District. After nail-biting competition, Templeton Middle School produced its school champion from the top eight finalists in its Geographic Bee. Eighth-grader Tate Hutchinson emerged as the 2016 school champion after rounds of intense questions, up against seven other school finalists. The other finalists were Joseph Cady, Owen Davies, Aidan Enneking, Connor Gordon, Abhijeet Puri, Shiva Senthil and James Strasburg. Senthil took second place, and third place went to Puri. All Templeton students participated in a preliminary round by taking a 25-question written test. Students who scored highest on that test advanced to the semi-final round and the eight finalists took part in the final championship round Jan. 19. As the school champion, Hutchinson will take a written test to qualify for state level competition. Up to 100 of the top scorers in each state will be eligible to compete April 1 in state level National Geographic Bee events. The winner of each state bee will travel to Washington, D.C., in May to participate in the national event.